One of the most common issues I see in marital therapy for couples of all ages is the problem of not spending enough time together. Modern life has given us many blessings and shortcuts and conveniences, but instead of simplifying our lives so we can enjoy life together, we often get so busy we put each other on hold. Literally, I will work with people about their schedules so they can squeeze some time together. If you think about that, even for a minute, it’s really sad we’ve filled our lives so full we’ve put ourselves off the list! We put our jobs and kids first, our housework and chores and pets, our church services and volunteering and then we wonder after ten years of this why we don’t like each other much! Fortunately, most of the time, the couple discovers or even knows, that if they did spend time together alone they would enjoy it and enjoy each other. This is a good sign for it tells us the problem is a structural problem (how they structure their use of time) and not a relational issue. Obviously, sometimes it is a relational issue, but you’d be amazed how much an enjoyable time can wither away indifference and anger, the two marital poisons. From time to time I’ll throw in a dating idea here on the thrivingcouples.com web site to encourage my regular readers to keep your creative juices flowing. If you haven’t thought of it, you can’t do it! If you know about it, it can become an option. So here’s a new idea my wife and I enjoy: Fall Camping. This year we’re going in October to SE Iowa to one of our beautiful Iowa State Parks. I got on the reservation site online and got us a campsite right on a lake. An advantage to camping in the fall is there are fewer people, so it’s easier to get reservations and the spots you might enjoy. 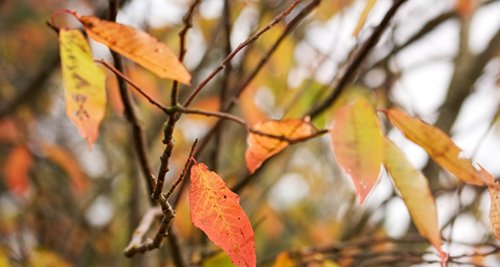 Check out this article on the fun of fall camping: 8 Reasons to Go Fall Camping. Some of the 8 reasons are fewer bugs, wonderful scenery, fewer people, and unique activities (like visiting an area orchard). For me the number one thing is sitting by a campfire on a cool fall evening. How can you beat that? At the Reservation website you can put the town, park, date and type of campsite and the system will tell you what is open. That’s how we found our lakeside campsite. A couple of years ago we camped at a place called Sleepy Hollow near Iowa City and had a beautiful pond outside our trailer door. 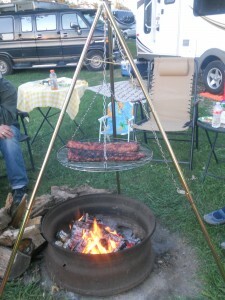 Of course, one of the main attractions of fall camping is campfire cooking. This is our first go around grilling baby back ribs on our new tri-pod grill. They were a hit. We took a side trip to Kalona, Iowa. 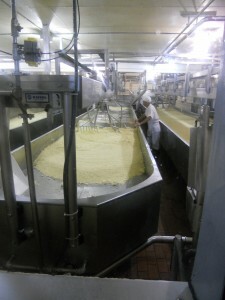 complete with a stop at the Twin County Dairy where they make white cheddar cheese curds while you watched. Oh, my. Very good. Kalona is an Amish and Mennonite town with a number of quaint shops we enjoyed. Kalona is a half an hour south of Iowa City and a great place for a day trip date any time of the year. 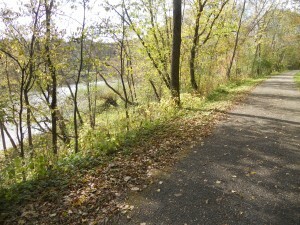 Last year in late September and this year over Labor Day we hit SE Minnesota and went biking on the Root River Trail. It is one of the premier bike trials in United States and it’s only 4 hours away from the Ames-Des Moines area. The scenery is breathtaking in the fall. 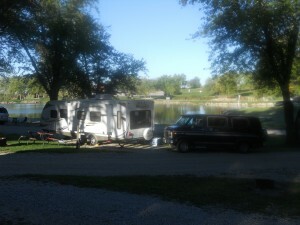 We also liked our campground, Eagle Cliff, just 3 miles from Lanesboro. They also rent canoes and tubes and have vans to take you and pick you up after your trip down the Root River. The Trail is paved and follows the Root River for most of the way. There are nice little towns every five miles or so and you can rent bikes. Lanesboro is the main village that promotes itself as catering to the folk that are visiting and there are several outfitters there. Trout fishing is also popular. In the warmer months people tube down the river. You can also rent canoes which would make a beautiful trip in the fall. Lanesboro promotes itself as the “Bed and Breakfast Capital of Minnesota”, so if you aren’t into camping, you can still enjoy the area in some of the historic homes in Lanesboro. 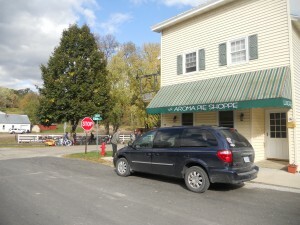 If you visit the area you will quickly discover the number one stop is the Aroma Pie Shoppe in Whalen, Minnesota. It’s right along the bike trial and a must stop for all the bikers. It’s only 5 miles from Lanesboro, so even if you are not in bicycle shape you can rent a bike in Lanesboro, get a taste of the trail along the river, and then taste the fresh pies for a mid-ride break. Yum. Whalen, a town of 63(! ), is famed for the “Stand Still Parade” where the parade stands still and the people walk the route. What a great idea! The next one is May 16, 2015. 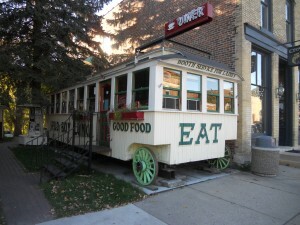 You’ll also discover the Spud Boy Lunch diner in Lanesboro which in the only wooden diner west of the Mississippi, completely reconditioned by the owner and chef, Gordan Tindale. His wife, Val, is the waitress and the two are great hosts. The waffles are served with fresh maple syrup from the Iowa Mississippi River valley. Oh, yeah. Check out their menu. This year we’re visiting the Villages of Van Buren County in SE Iowa. Their claim to fame is there is not one fast food restaurant or stop light in the entire county. Every fall they have a Scenic Drive Festival, this year on October 11-12. My wife and I are checking that out, but the area has received the Iowa Tourism County of the Year for a number of years running and is included in the book “1000 Places to Visit Before You Die,” only one of nine places in Iowa listed in the book. I’ve heard of the area from several clients rave reviews over the years, so we’re finally checking it out. We’re camping at an Iowa State Park a county over as the camping spots for that time of year were already full by the time we were planning to go. These are just a few of the places we’ve visited in the fall around Iowa. There are many more. Take your spouse for a little jaunt and get acquainted with each other and our heritage and scenery at the same time.